The role of the senior data scientist is one of technical leadership of a portfolio of projects funded by industrial income and strategic university investment. This includes the ‘PV monitoring phase 3’ project in collaboration with National Grid, and also PV power forecasting. I develop technical approaches to R&D, coordinate the investigation of these approaches with team members (PhD students, Principal investigator, IT manager and business development manager), write computer algorithms and help design and build IT systems to support the deployment of the algorithms. The role also includes coordinating the maintenance of operational code and services (such as PV_Live) and working with IT manager to ensure that the systems are resilient and secure. Lead the technical development and delivery of operational IT services to support the GB solar power industry. This includes solar power monitoring, forecasting and performance evaluation as required by industrially sponsored projects. Support the development of secure and resilient services by working closely with the Sheffield Solar IT manager. Support the development of new commercial and industrial relationships and a future project pipeline by working closely with the PI and business development manager. Employing knowledge of computer and database programming (python, matlab, sql, bash, c/c++, html, css) alongside a comprehensive understanding of the underlying physical processes to devise and realise innovate research. A recent graduate of the University of Sheffield, Jamie completed a Master of Physics Degree (MPhys) in June 2013. His undergraduate projects focused heavily on computational simulations of renewable energy technologies, culminating in a 4th year project simulating charge transport in organic semiconductors of the type used in organic solar cells. 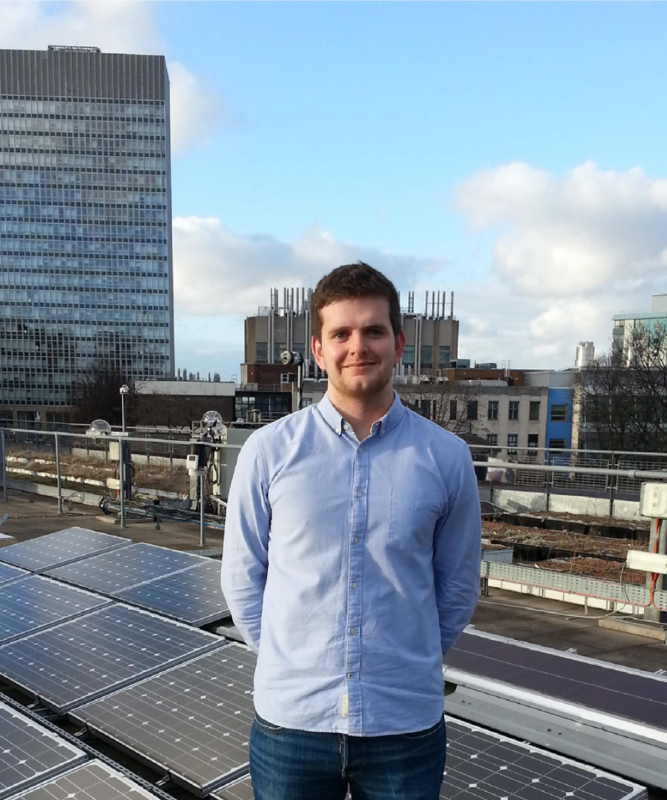 He has worked for the Sheffield Solar group since July 2012. Our Microgen site records PV generation in the UK by collecting data from volunteers.